Summary: Gregor Samsa awakes to discover that he is an adorable kitten. He is not a metaphor for alienation or isolation, but merely a big fluffy thing that one would rather cuddle with than search for symbolism in. When Quirk Classics gets their claws in another masterpiece, you will be wishing that you were reading A Farewell to Arms and Legs or The Scarlet Bloodletter instead. This is the third advanced copy of a novel that I have won/been gifted by Quirk Books. They are an amazing publishing company who truly cares about their customers and I love most everything they put out, but it would be wrong of me to say I enjoyed the newest offering from their Quirk Classic series. The Meowmorphosis follows the same basic format of the other literary mash-ups, classic text plus a fun extra to enhance or alter our perception of the original. So when I heard about a re-imagining of Kafka’s novella The Metamorphosis but with Gregor Samsa being transformed into a kitten, I was intrigued. Sadly, the novel itself does not deliver. Well, it delivers, it just doesn’t deliver anything good. Or anything very kitten-y. In the original, Gregor awakes as a giant cockroach, paralleling the alienation and isolation from his family brought on by his rigorous work schedule. This same premise does not work when the character is transformed into a kitten. He is not hideous and painful to look at further alienating him, but rather oh so fluffy and adorable that his mother and sister cannot help but cuddle him. I feel sympathetic toward him as a character, but this is due to his overall cuteness and my womanly desire to snorgle all cute and cuddly animals rather than because of Gregor’s inner turmoil or his abandonment issues. And trust me, Freud would have had a field day with all of those. One thing which this mash-up does differently is the intertwining of two different texts. In order to make the novel longer, or so I read in an interview, Cook added a middle part to the narrative in which Gregor escapes. I had assumed this was original material since the interview also stated that this novel was the first “true mash-up” (a statement which I found to be a little haughty considering how painful the novel was) but it turned out to be bits and pieces from Kafka’s novel The Trial. This is the only bright spot in the novel, and it isn’t much of a bright spot at that. At this point in the narrative, Gregor escapes the apartment and heads out to explore the world at large. On this adventure he meets the tabby Josef K. who was once a bank clerk but is now a cat. He also meets Franz and Willem, who were once a psychiatrist and an insurance man respectively. All three of these characters and the text that surrounds them are from this other Kafka story, Josef being the main character in the aforementioned novel. As in the source material, the main character (originally Josef but now Gregor) is found guilty of an unknown crime (although not gnostical turpitude) and is put through a nonsensical trial. It was in this section that I snickered my only snicker (insert vorpal blade reference here). This occurred when it is mentioned to Gregor that he should not be upset that he awoke a giant kitten. “Be grateful, I say” one of his prison guards tells him, “I once knew a man who woke up a cockroach”. Three Stooges style sound effects. Although saying that I didn’t smile when I read the discussion questions would be a disservice to the author (who is using a pen name, probably out of sheer embarrassment). In the very back of the book, as can be found in a lot of classical novels, are a series of pretend questions meant to be used to get the reader thinking about the text. The funniest question reads, “Dreams play a major role in this story from the very first line. Do you think Kafka intended us to read the entire story as a dream from which Gregor has not woken up? If so, do you think Christopher Nolan might be able to direct the movie?” Yup, the novel was so bad that the only time I laughed out loud was in the discussion section. At an Inception joke. I found the most disappointing alteration (giant kitten notwithstanding) to be the ending. Rather than dying over an apple stuck in his carapace (which would be impossible because to the best of my knowledge kittens don’t have carapaces- except maybe robotic kittens) Gregor suffocates to death. After his father throws apples at him and misses, he tosses a ball of yarn, which somehow gets entwined in Gregor’s collar. This collar is already tight because for some reason he is enormously fat despite the fact that he is barely fed. This string combined with his tight pink collar emasculates him to the point of death. I’m kidding, that would have been a way better ending. 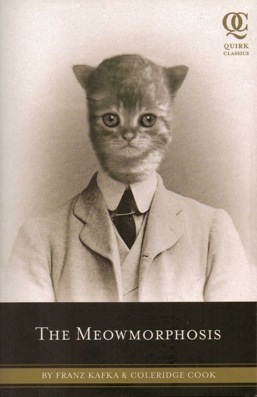 As a whole, The Meowmorphosis was a dry version of Kafka’s short story with an okay middle and a very poor beginning and an even poorer end. Whereas most of the other novels rely on humour and parody to drive the text (while still staying true to the original), this book is merely a pastiche of jokes about kittens, none of which involved speaking lolcat. I can haz better metaphors? -Kittens are pretty damn adorable LOOK!!! If only the novel had been half as amusing or entertaining as the trailer. And if only curiosity had killed the cat quicker. What Do You Do With a BA in English? No, Seriously. I’m upset that the mutated version of the word “Metamorphosis” did not keep the same number of syllables. Meow-tamorphosis. Woulda preferred it. Dammit. We’ve been talking about Daiquiris for years, haven’t we. Yes, I believe we have. Find a place. I’m gonna make it happen. Soon. Sometime. Like… a weekend, if you’re not working. Get your-Kenny to have a daiquiri too… A pair of super manly Kennys enjoying Strawberry Daiquiris. I don’t work weekends. Not anymore. =) So let me know when you’re free and we’ll find a daiquiri place. I also don’t work weekends and almost never have anything but family functions pre-planned… Meaning I just sorta do something as it comes up. Sooo… Any weekend! From now until the end of July! Also: … How do I make my own account and change that weird rabbit-spring-dude icon you got going. Is this WordPress? Do I have to do through WordPress…? We’re free all next weekend! And every weekend in July except the 16th, 17th, and 30th. Next weekend, Saturday the 11th? This is happening. Where can we get some sweet daiquiris now…? Kenny seems to thing Marita’s Cantina is a good place for daiquiris. Maaaan… Gonna have to park in New Brunswick. Gonna be unfortunate. I’ve walked by that place plenty of times though and never been in… I’ll trust Kenny’s judgment.